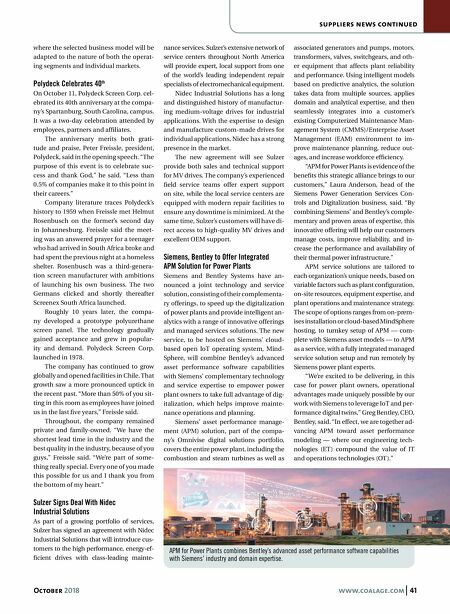 40 www.coalage.com October 2018 suppliers news Famur Set to Become Top 3 Global Player in 2023 Rapid international expansion, maintain- ing a leadership position in Poland, offer- ing end-to-end solutions that exploit tech- nological innovation, and entering the hard rock mining segment are the prin- cipal goals defined in the Famur Group's new growth strategy for 2019–2023. The Polish company is set to increase its rev- enue to PLN 2.5 billion to 2.7 billion ($660 million to $713 million) by 2023, of which more than 50% is to be export revenue. Following the implementation of the new strategy, Famur wants to become the pre- ferred global supplier of end-to-end, inno- vative solutions for the mining and cargo handling industries and a top three man- ufacturer of machinery for the soft rock mining sector. The new growth strategy puts custom- ers and their needs at the center of the com- pany's activities, as reflected not only in its vision, but also in its mission statement, which emphasizes that Famur is built by people who share a commitment to sup- porting customers in achieving their goals by providing effective solutions in confor- mity with the highest environmental stan- dards. The cornerstone of the strategy are the values that will serve as a guide for day- to-day operations of the entire organization. "In our strategy, a strong focus is placed on close cooperation with the cus- tomer, which encompasses providing as- sistance in obtaining financing, designing effective, reliable, safe, innovative solu- tions tailored to customer needs that offer value for money, optimizing manufactur- ing and logistics processes to deliver qual- ity products always on time, and providing professional 24/7 after-sales support and a complete range of added services," said Famur President Mirosław Bendzera. Maintaining leadership position in Poland — Famur will seek to maintain its strong position at home as the supplier of choice for customers in Poland. They can count on Famur to expand its range, step up product innovation, and deploy a cus- tom-tailored training and maintenance and support systems. Plans are also in place to commercialize new solutions that use robotic, virtual reality, simulation and Big Data technologies, and to implement the Smart Mine concept at mines in Poland. Becoming a top three global supplier of soft rock mining solutions — Famur plans to significantly increase its presence in inter- national markets within the next five years, so that in 2023 more than 50% of its revenue comes from exports. In the priority mar- kets, where it has an established position now, the company will strengthen its or- ganic growth through expanding the main- tenance and support centers and increas- ing the availability of after-sales services. In opportunistic markets, where Famur is still building its position, it wants to grow by forming strategic alliances with local partners or by acquiring businesses with a stable customer base and market share. A comprehensive offer with recurring revenue representing more than 25% of to- tal revenue — Famur wants to be a supplier of comprehensive solutions for the mining and cargo handling sectors. During the next five years, the company plans to signifi- cantly increase its installed machinery base in Poland and foreign markets, and intends to steadily develop its aftermarket business while stabilizing the lease revenue. At the same time, it plans to expand its portfolio by offering high value-added services, such as predictive maintenance and diagnostic reporting, to ensure that more than 25% of the group's revenue is recurring revenue. Entering a new, rapidly growing market of solutions for the hard rock mining sector — The company intends to enter the rapid- ly growing hard rock mining business. This goal is to be achieved by acquiring a com- pany with revenue between PLN 100 mil- lion-200 million ($26 million-$52 million) and driving its further organic growth. "Expansion into foreign markets is one of our key engines of growth and should make it possible to derive more than half of our revenue from abroad in 2023," Bendzera said. "Clearly defined di- rections of expansion and the right strat- egy of growth or entry into each of the se- lected markets, as well as development of end-to-end solutions and a stable position in Poland will allow us to become one of top three global manufacturers of mining equipment for the soft rock mining sec- tor. We also want to build a third strong segment within the group, in the rapidly growing hard rock mining business." One of the key areas supporting the implementation of Famur's strategy is smart technology, where the focus will be on development and commercialization of technologically advanced solutions en- abling the transformation and further im- provement of efficiency and safety in the mining sector while reducing operating expenses and adverse environmental im- pacts of mining operations. The company also wants to scale up through organic growth, strategic partnerships and M&As, Mirosław Bendzera, president, Famur, explains the company's new five-year strategy.